To make the best of your time in the great outdoors, you have to make sure that your gear is complete. You’ll be much more comfortable when you have the right equipment for your outdoor adventure. On some of your trips, you will decide to spend the night under a blanket of stars. For that to be an enjoyable experience you’re going to want a good sleeping bag. There is a big variety of sacks on the market, with each type sporting its own features. The Abcosport Single Sleeping Bag provides you with a very comfortable way to sleep outdoors so you can relax and re-energize for the day ahead. Its dimensions are 86.6” x 29.5” when opened, while it becomes a more compact 16” x 9” when folded and packed. It weighs around 4.2 lbs. The bedroll has a zippered edge; it can be opened up flat into a blanket. The inner, 100%-polyester lining provides a very smooth and comfortable feeling to the skin. The outer lining is made of 210T polyester that contributes to the durability of the item. Furthermore, the high-quality stitching makes it very durable and reliable for years. This product is suitable for use even in extreme weather. It can keep you warm even at temperatures as low as 20° Fahrenheit. This is thanks to the double-fill technology that is secured in place with the S-shaped quilted design. 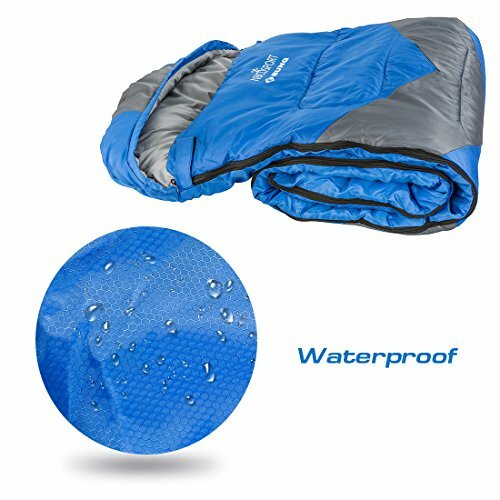 It is also waterproof to help prevent you from feeling damp and cold outdoors, or even indoors. You’ll like its attractive royal blue color, which should please both men and women. Unlike other products that restrict your feet because of a narrow base, the Abcosport Single Sleeping Bag has a wider base to make sure you have enough room to move your feet. Furthermore, the shoulder area is wider than the foot area. It also has a hood-like top that acts as a pillow. The great thing about it is that it stays in place! It is easy to clean and is machine-washable. Thanks to the polyester fill and fabric, it also dries quickly so that it can easily be made ready for your next adventure. The travel-friendly carry sack makes it easy to carry and store. There is also a compression sack with straps so that you can fold it up to make it compact enough to carry with your gear. 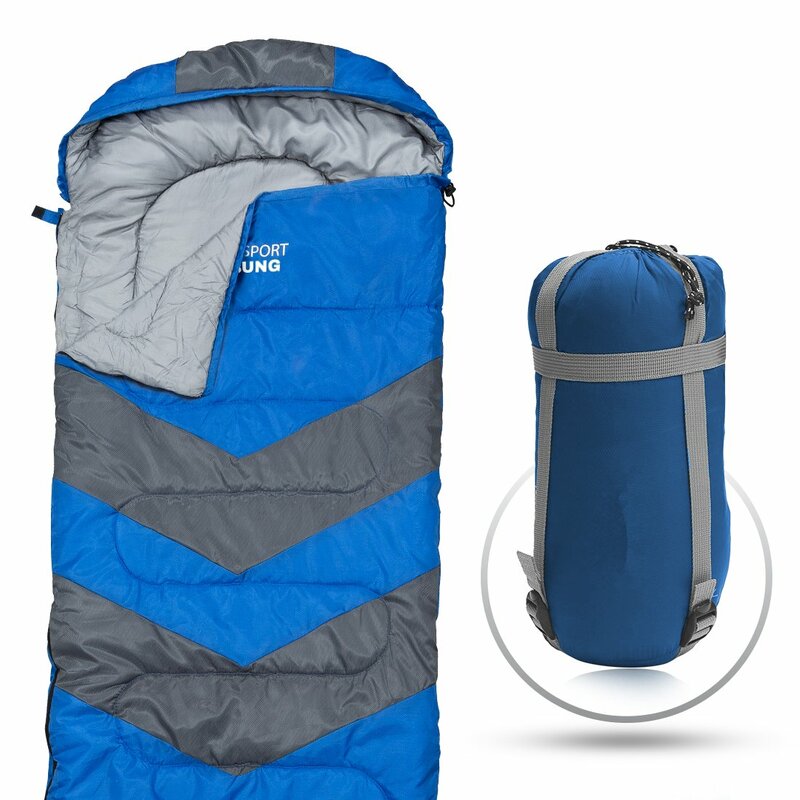 This sleeping bag is great for outdoor use, but many also love using it indoors. It comes with a 100% risk-free satisfaction guarantee. 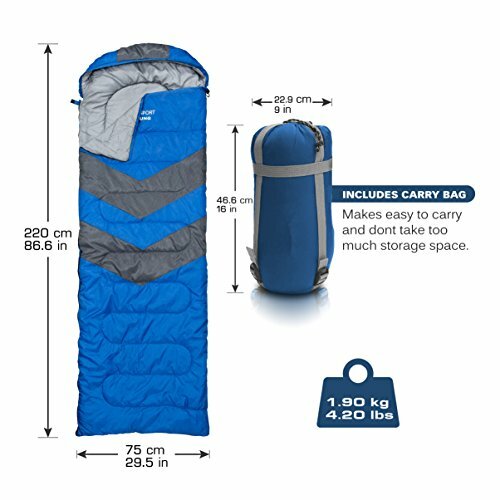 This product is an affordable sleeping bag which has some great features. Based on the features, pros and cons, I have mixed feelings about it. On the good side, it is a pretty affordable, light-weight and comfortable. On the other hand, it may not fit larger adults and it is one of the bulkier bedrolls. In that regard, I still recommend this product but only to those with smaller frames. It is still capable of providing enough warmth, even on the coldest nights, and would be a great choice for smaller people. It is also easy to wash and to carry. 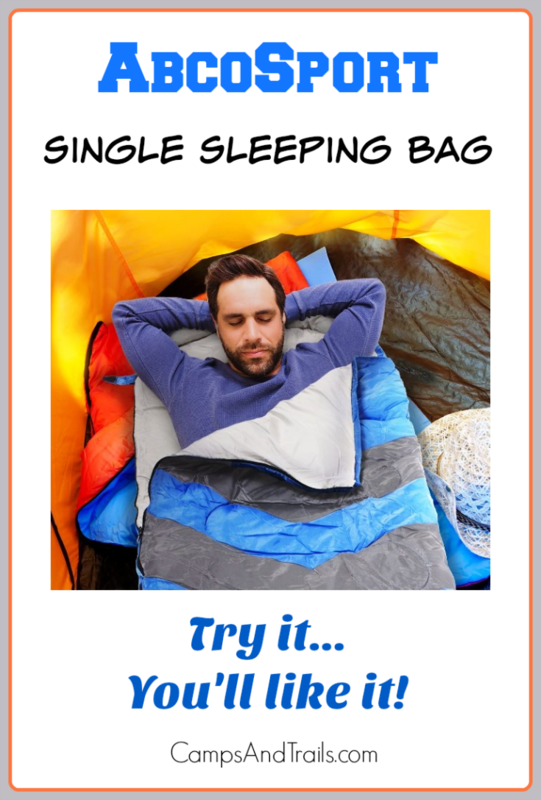 Although it is not the most compact sleep sack available, you can still go ahead and purchase it if you have enough room for it in your backpack or if you just plan to attach it to the outside of your backpack. Easy to transport and store, can fully be open up into a blanket. It can be difficult to put the sleeping bag back inside the cover.